Good news from CSO Yachts that their listing for sale, the 30.5 metre motor yacht Vespucci, is sold to a direct client. Formerly known as Andrax, she is a displacement gentleman's yacht built in steel and aluminium by CRN Ancona for Carlo Riva and delivered in 1978. The build foreshadowed the current situation where both Riva and CRN are now members of the Ferretti Group. 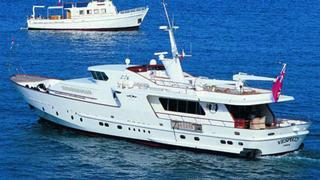 Vespucci had a thorough refit in 2006 and accommodates eight guests in four staterooms. The master suite is on the main deck and has a queen size bed while the VIP stateroom is below with a queen size bed and there are a further two twin cabins. The master and VIP suites both have full baths en suite while the two twins share a connecting en suite bathroom with shower. Twin 435hp Caterpillar give Vespucci a cruising speed of 11 knots and a range of 1,650 nautical miles. Her asking price was €900,000.